Discussion in 'Model X: Interior & Exterior' started by scottf200, Sep 2, 2015. Hattip to MorrisonHiker's post. I thought the Model X windshield was totally new and unique but it looks like it's been done. What that gives us tho is some great pictures to visualize what driving the Model X may feel like (yes, I realize the very top is shaded). It reminds me of the Vauxhall Astra windshield from a few years ago. AND look at the door handle location (see where the doors lock at). I suspect the reason windshields like in that Vauxhall and 55 Chevy didn't catch on is that the cars are too damn hot when the sun is out and there is too much glare. It is going to be interesting to see how Tesla tints the rear section of the X windshield and if the driver and passenger have any dynamic control over the tint level. In that first image...the part labeled "roof" appears to be tinted glass, not metal. Is the label trying to indicate otherwise? Sorry for the confusion. Definitely not trying to indicate a normal metal roof. 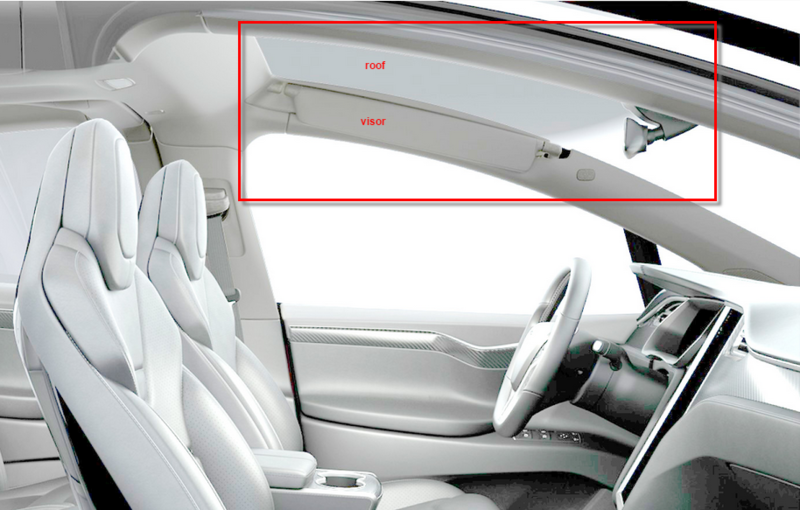 The point of the thread was the Model X has glass that goes up to where a normal cars roof is (right above your head). And that there were/are other cars like it unbeknownst to me before yesterday! Gotcha. This makes me happy to see...I'm 6'2" but with a 30" inseam so I'm long at the top and I have issues with many cars where I sit so high I cannot see stop lights, etc without leaning forward because of the roof line. This would certainly make my driving experience better and one of the reasons I decided against getting the S.
This video is great because it pans up and lets you see what the tinted part may look like. This extended windscreen that goes up overhead looks amazing to me, and I hope its for real on X. Reminds me a lot of the Roadster with the glass top that some of us have - having the sky above being so open. 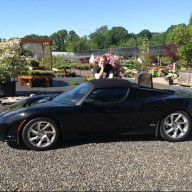 The additional benefit of being able to easily see stop lights isn't lost on me - I frequently can't see any of the three lights in the Roadster, and sometimes do look over the top of the windscreen through the glass top to know when it's my turn to go. It should be OK long as Tesla tint the roof section the same way as they tint the pano on the S. You can always add additional tint film if that's not enough. I have 75 PhotoSync tint film on the windshield, but not pano, of my S. I would likely do the same for the X with windshield and roof together. Honestly, this makes me want the X more than the S more than anything else (still lean toward the S, though). Can't wait to drive this thing. Unfortunately, will be in Florida for an EV conference in late October and Tesla tells me that's still too early for a media car/loaner (as expected, of course). 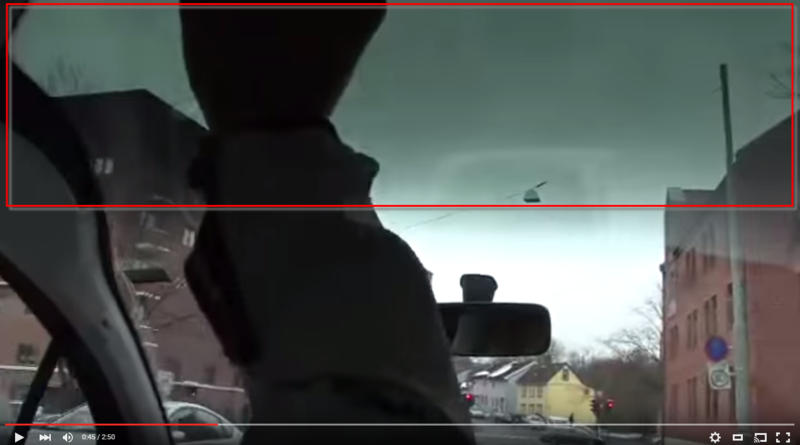 Has anyone figured out how they get power to the electronics for things like self-dimming mirror and the cameras on the Model X mirror with this windscreen design?? I would assume they'd embed the wires in the glass, like an antenna. Likely be visible, but you'd have to look closely. I just had my windshield replaced... and wow, was there a bunch of stuff embedded and stuck on the replacement glass! The windshield we are talking about is pretty clear in this pic. I know the feeling, having a somewhat similar shape. I just barely fit in my Volt, and headroom was definitely a reason I was thinking X. The open air feel and not having to stretch to see red lights will make for a much more pleasant drive. The biggest reason that the Biscayne windshield didn't catch on is that it was just a concept car and never went into production. The name was later used for the second-line Chevrolet model, (behind BelAire} but not with any of the concept features. Check out the cool manual shade you can pull down on the Citroen! Of course I haven't actually tried it, but I'm really happy about this design idea - possible repair fragility and complexity notwithstanding. Open sights when driving has always been important to me and family and is another feature that may shape up the X as the most enjoyable vehicle we could have. If electrochromic tinting of the high glass windshield is not available or is prohibitively expensive, roller blinds!